Able to decrease the embodied energy of the foundry products by over 25%, reducing drastically its carbon footprint. The demonstration will be performed in the aluminium, iron and steel sectors. are due to a new furnace that, by means of a power transmission system based on induction, will allow a highly flexible production. This increase on the production flexibility attends to the current variability of the foundry products demand. 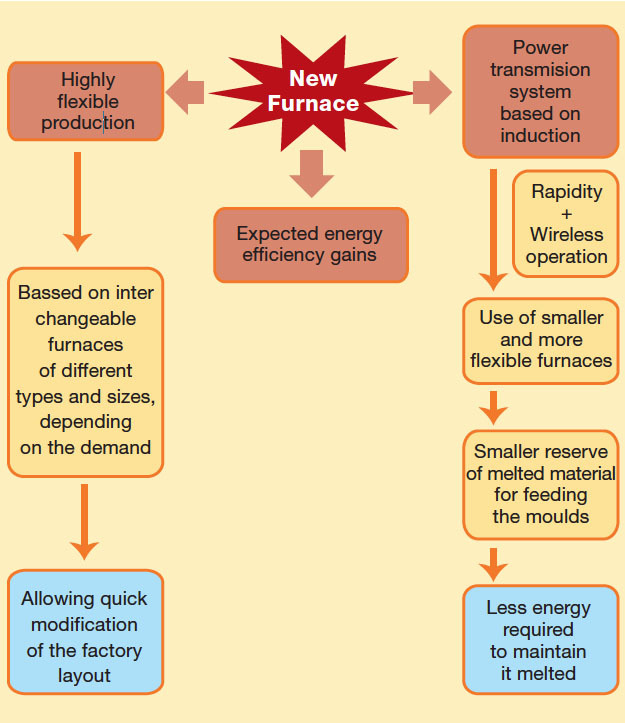 In addition, the wireless furnace will provide a flexible operation, allowing a quick modification of the factory layout, which will be based on easy interchangeable furnaces of different types and sizes, depending on the demand. new processes and equipment for the metallurgical energy intensive industries, to reduce the energy consumption in the casting and manufacturing processes and to reduce the GHG emissions with the aim of achieving lower carbon footprint products.